← 2013: 6th of 13 Things I Want to Know: What is the Biggest Eye Ever? 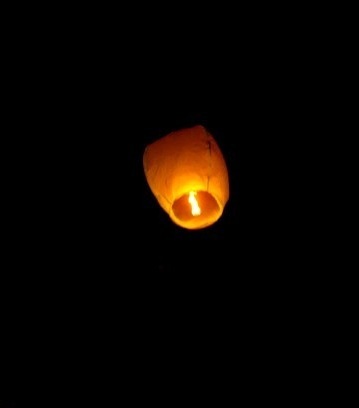 2013: 7th of 13 Things I Want to Know: Sending Up a Bag of Light – Why? 9:30 PM local time, a beach on the Pacific; Summer time, completely dark, and I was on my way out when some commotion caught my attention. A group of people of all ages were gathered around some light source. Suddenly it rose up in the air, and everyone was cheering and clapping. I stopped, fascinated. 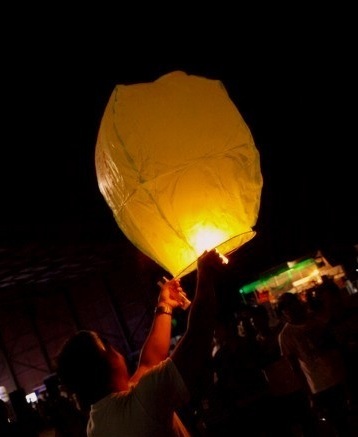 A small fire was dancing around in the lantern’s bag while it was rising higher and higher. In just a few seconds it was too small for me to react and take a picture, but it looked exactly like the ones in the pictures posted here. This is how this story started, and it’s been sitting in draft for a while because I didn’t know how it ends. Now I do. It’s all about sending things up. A different beach, same planet, just today; Kids sending up a remote controlled helicopter. 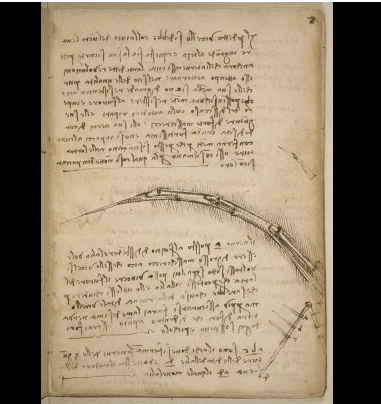 Go back in time, 15th century Italy: Leonardo Da Vinci working on his drawings for flying contraptions. A spin forward in the time machine: hot air balloons followed by the giant Zeppelins. Another spin, a small airport just around the corner: a dad and his two kids sitting on some rocks at the edge of the runway, eating sandwiches and watching aircraft taking off and landing. Smithsonian’s National Air and Space Museum: Leonardo Da Vinci’s notebook, containing drawings and notes about bird flight has arrived, for the second time, on loan. NASA’s account on Twitter: a government institution communicating about sending things up. Ardusat Kickstarter: a tiny cubicle satellite, paid for by the crowd, launched into space and the crowd take turns controlling it, taking pictures and running experiments. Bruno Mars: talking to the moon. People have always been busy trying to rise up and leave our nest. Those who can – do. Those who thought about it early on – carve the career path that takes them there. Those who obsessed early enough – work in related industries. Percent-wise, the number of people who care about it in a significant way and show any degree of interest and support is very small. If you ask people around you – colleagues, friends, family, neighbors, chances are they couldn’t care less, though they might show mild interest in significant news. But in numbers this tiny fraction does still translate to several million. A few million people ‘think the world’ of space exploration, aviation, and sending things up. Their support will ensure that progress doesn’t stop. I think to them Chris Hadfield dedicated his version of David Bowie’s words: “Ground Control to Major Tom!” This once-in-a-lifetime recording was published on May 12, 2013, on the eve of his last day as commander of the ISS, and last day on board. This entry was posted in Human Experience, Space Exploration and tagged astronaut, Chris Hadfield, ISS, launch, Leonardo Da Vinci, Space Oddity, Zeppelin. Bookmark the permalink.